Your smartphone already wears a number of hats: camera, MP3 player, and it can even make and receive calls—but with the right set of apps, you can do much more with your handset. Here are 8 scientific instruments your phone is capable of transforming into. This will be especially useful to any of you living near a fault. MyShake can detect seismic activity using nothing but your Android phone. The app’s special algorithm picks out an earthquake shake from other types of movement. If enough people install it, the University of California, Berkeley team that created it hopes to use it as an impromptu early earthquake warning system as well. An iPhone version is apparently in the works but not ready yet. Your smartphone comes equipped with an gyroscope that knows how flat or tilted the device is. Several apps can easily take advantage of that, the easiest of which is built directly into Google: try typing “bubble level” into the Google search bar on Android or iOS to bring up simple level tool. Using a bulky camera lens clip and an Android or iOS app, MoleScope lets you examine skin moles exactly, just as its name suggests. The app scans and tracks suspicious moles on your body and guides you through a self-diagnosis process. You can also send off scans to a qualified dermatologist. If you want to stick to an app without an accessory, then SkinVision is available for Android and iOS devices and promises just as high a level of accuracy. Plenty of wearables—from wristbands to chest straps—can monitor your heart rate, but you can do it with your phone too if you have a suitable app installed. Instant Heart Rate, available on Android and iOS, is one of the best. It works by scanning the changing color of your fingertip through your phone’s camera and working out your current heart rate accordingly. It’s not the most elegant solution, but it works—and with no additional hardware. 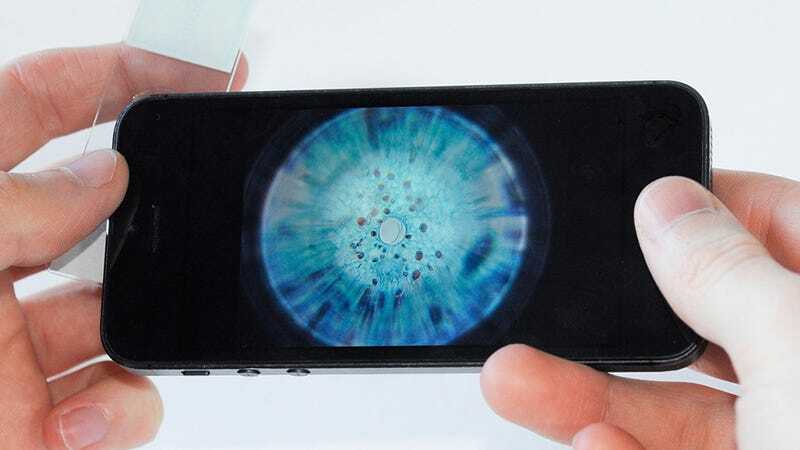 Born on Kickstarter, the Micro Phone Lens gives your smartphone’s camera a whopping 150x magnification boost, allowing you to use it as a portable microscope (it works best when used with samples on microscopic slides). The small accessory you stick to your phone’s camera lens can apparently function with any camera rated as 5 megapixels or higher. If you just want the adhesive-free lens itself without any accessories, prices start at $30. Apps like Decibel Meter Pro ($1 for iOS) use your smartphone’s microphone to turn your handset into a sound level meter—though accuracy may vary depending on the quality of your handset. Those of you on Android might want to try the free Sound Meter instead. There are several other alternatives to experiment with. Useful for reporting the neighbors for being too loud late at night, at least. It’s likely that your phone already has thermometers inside it, but ones designed to measure internal component temperatures. To get an accurate reading on the air around you, you need an external sensor like Thermodo. It plugs into the headphone jack on your Android handset or iPhone and then works in tandem with the companion app to tell you exactly how hot or cold it is in your current location. The cheapest Thermodo sells for $30. This one is only “coming soon,” but it’s still worth mentioning: the successfully Kickstartered Scoutee combines an app and a small detector device, giving you an on-the-go speed radar for measuring pitching speed. The kit lets you log speeds and record videos, save and analyze pitch parameters and game results, and of course share stats with the wider world. If you missed the crowdfunding campaign, the pre-order price is $170.